Even given the incredibly low bar he has set over the course of his many decades in public life, Donald Trump’s wire-tapping tweets seemed to break new ground for the Commander in Chief. The direct connection between fringe, far-right talk-radio conspiracy theorizing and a verbatim message from one of the nation’s most powerful people couldn’t even be obfuscated or passed off as something else by Trump’s surrogates. Even Sean Spicer ducked questions about it. You can only paint over the fact of Trump’s incompetence so much, but Twitter, god bless it, is a direct connection to the man’s brain, which is a decaying funhouse of insecurities, old grudges, paranoia, and barely repressed rage. You know who else that might be said of? The Joker! Mark Hamill has continued his ongoing public service of re-recording Donald Trump tweets using the voice of Batman’s arch-nemesis, this time bringing to life Trump’s newest and least convincing conspiracy theory. He’s done this twice before, first with his malevolent “Happy New Year to all my many enemies” tweet and then with Trump’s daring anti-Meryl Streep take. 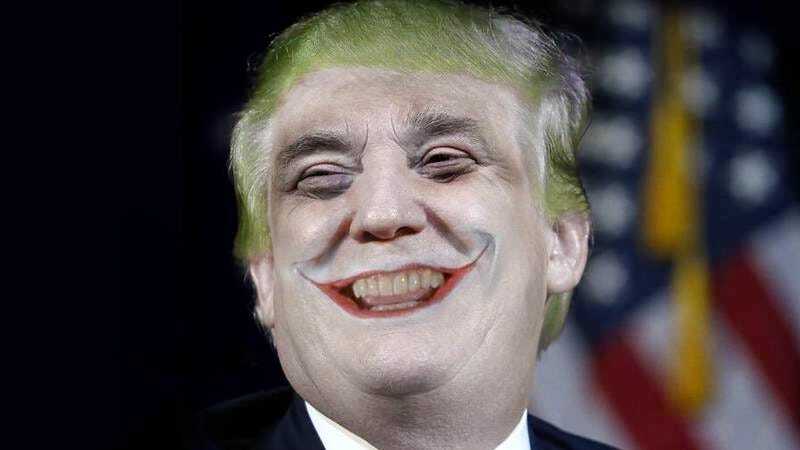 Each time he has accompanied it with a piece of Trump/Joker fan art, but this one is by far the most ambitious.